A study from Deakin University in Australia looked at a history of amenorrhea in gymnasts and later-life bone density. Why do a study like this? Female gymnasts often become afflicted with hypostrogenism (low estrogen) from extreme training couple with the need for low body weight. This leads to issues such as late menarche (first menstrual cycle) or menstrual dysfunctions. The Deakin University study compared gymnasts who had amenorrhea during their competitive years to gymnasts who did not. Results? There was no difference in spinal bone density between the two groups, but the peripheral skeleton (arms, legs, pelvis) showed decreased mineral content in gymnasts who had had amenorrhea. This is surprising because the high impact nature of gymnastic training should lead to a greater bone mineral content later in life (the study didn’t compare non-gymnast women, it is possible that even lowered bone mineral density in amenorrheic gymnasts – compared to non-amenorrheic – may still be greater than the bone density of women who were sedentary with normal menstrual cycles during the same competitive age). So steps should be taken to prevent amenorrhea in competitive gymnasts to provide for bone health later in life. Bone. 2009 Oct;45(4):760-7. Epub 2009 Jun 30. History of amenorrhoea compromises some of the exercise-induced benefits in cortical and trabecular bone in the peripheral and axial skeleton: a study in retired elite gymnasts. Ducher G, Eser P, Hill B, Bass S.
Bone geometry and density in the skeleton of pre-pubertal gymnasts and school children. Ward KA, Roberts SA, Adams JE, Mughal MZ. The bone problems associated with amenorrhea come with reaching puberty then. Is a different sport the answer? J Bone Miner Res. 1995 Jan;10(1):26-35. Gymnasts exhibit higher bone mass than runners despite similar prevalence of amenorrhea and oligomenorrhea. Robinson TL, Snow-Harter C, Taaffe DR, Gillis D, Shaw J, Marcus R.
Repeat: being a gymnast is fine, it is amenorrhea that causes problems. First, you need to know the causes of amenorrhea: Nutrition-related and lifestyle-related causes of amenorrhea include too much exercise (especially endurance exercise such as running or cycling), losing excessive weight, excessive weight gain, eating disorders, poor nutrition, and too low body fat. Other causes of amenorrhea in gymnasts include stress, anxiety, hormone imbalance, the use of certain forms of contraception, and endocrine disorders. So… stay away from all of that. Extreme weight loss from starving/crash diets can cause amenorrhea. The solution here is to keep weight in the correct range (for a gymnast) so that crash restrictions are not necessary. Eat plenty of fruits and vegetables. Cutting out ALL carbohydrates may help keep weight where it needs to be without starvation, but carbs are necessary for the conversion of T4 to T3 (active form of thyroid hormone) without which organs start shutting down/malfunctioning, and the reproductive system is the first thing to go. Plus, fruits and vegetables are full of nutrients essential for performance and health in other ways. STAY AWAY FROM SOY. There is absolutely nothing good about soy. Nothing. And it messes with reproductive health in men and women. Limit/Ease Stress. Stress halts reproduction: stress from toxic foods, stress from eating disorders, stress from social life, stress from exercise, stress from schoolwork, stress from existential despair… Emotional stress can damage the reproductive system just as much as physical stress. This is a more individual solution. Whatever it takes: more sleep, tutoring, extra family time. 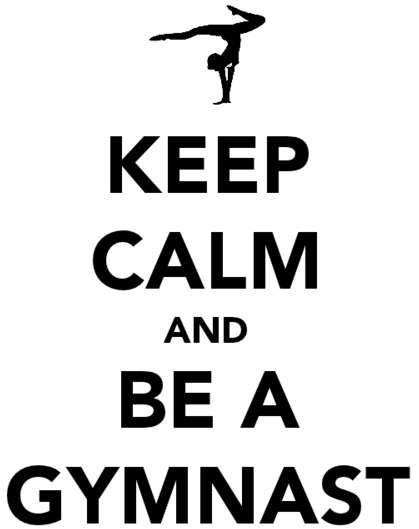 Reduce stress to increase your gymnast’s health.